The Communist Party USA, with its influence in the union and peace movements and its allies and supporters in the Democratic Party, may well be king makers in the US presidential elections. There is no doubt that the CPUSA will back whoever the Democrats choose to take on the Republicans, just as they backed Kerry in 2004. The question is which of the three main contendors, Edwards, Clinton or Obama, will they back in the primaries for the Democratic nomination. The party insists it will endorse no particular candidate for the nomination, but I have my doubts. There is considerable evidence that the CPUSA is leaning towards Barack Obama. As for the presidential candidates, we aren’t going to endorse one either now or later; although we should note that unlike in previous campaigns extending back nearly 30 years, the front-runners are cleaving in a progressive direction, including Clinton. Of the front-runners, Edwards offers the most programmatically, but at the same time, neither is he light years ahead of Obama or Clinton. We have to acknowledge the historic nature of Obama, Clinton and Richardson’s campaigns. A victory by any one of them – and I believe every one of them could win –would be historic. Furthermore, I believe that the country is ready to elect an African American or a woman or Mexican American to the Presidency. I don’t accept (and I don’t think that we should accept) the conventional wisdom or grapevine talk that a Black American is unelectable, that the American people are not ready for it. What is the basis for such a claim? We do know that Massachusetts elected an African American governor in 2006, that Illinois a U.S. Senator in 2004, and Tennessee nearly an African American Senator in 2006. The Illinois senator in 2004, that Webb refers to was of course Barack Obama. Obama won without much visible support from Chicago’s Democratic political machines. He campaigned with an army of volunteers that had multiplied since his primary victory in February. His landslide victory then was propelled by widespread support in the African American and Latino communities, a section of labor, peace activists, and progressive independent political clubs. This is communistspeak, for "we helped Obama get elected"
(Communist Party)activists from Illinois were immersed in the campaign to elect Barak Obama to the U.S. Senate. Obama won a landslide victory in the March 16 Democratic primary. “This was a historic victory. It was a victory for political independence and grassroots, coalition, and issue oriented politics over the machine and money,” said John Bachtell, Illinois Communist Party district organizer. Barack Obama has been the subject of several articles in the CPUSA press, while Edwards and Clinton have enjoyed only minor coverage. Now Obama has made the Marxist equivalent of appearing on the "cover of Rolling Stone"
The cover of the CPUSA's theoretical journal Political Affairs no less. Is that an honour or what! 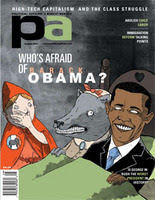 The cover story Who's Afraid of Barack Obama?, by Political Affairs editor Joe Sims, does not openly endorse Obama, but it does make it clear that he is regarded by the CPUSA as a serious contendor. A Black president in 2008? Just months ago, many if not most would have scoffed at the prospect. Yet as summer blossoms, so too is the candidacy of Illinois Senator Barack Obama. A recent spike in June polls, the second in three months, shows him in a statistical dead heat with the formidable Hillary Clinton of New York, with the remaining Democratic hopefuls trailing far behind. My guess is that the CPUSA will throw its considerable resources behind Barack Obama's bid for the democratic nomination. If he wins, they will be backing Barack for the US presidency in 2008. Whose afraid of Barack Obama? Well I am for one. In his book he said that the US must remain the World's dominant military super power to protect its 'interests' or something like that. He also said he really likes capitalism. If Obama wins it's just business as usual in the US of A. Building nuclear weapons, bombing other countries, arming dictators in the third world, backing corporate criminals etc. Amazing isn't it Cameron. I see Obama as a covert socialist. You see him as an apologist for capitalism and US "Imperialism"
Let's both hope he never gets in a position to prove either of us right. "If Obama wins it's just business as usual in the US of A. Building nuclear weapons, bombing other countries, arming dictators in the third world, backing corporate criminals etc." So I guess you Cameron have no problem if terrists take Iraq and retake Afghanistan, right? You know, from the likes of Osama bin Laden and his Taliban friends who were part of being involved in 9/11 or do you don't seem to care about the 9/11 victims and see them as "Little Eichmann"? Terrorists, viz. The Chickenhawk, President Cheney-Haliburton et al, they have taken Iraq ! "Terrorists, viz. The Chickenhawk, President Cheney-Haliburton et al, they have taken Iraq !" So you're calling the insurgency in Iraq, "freedom fighters"? Even when they massacre innocent Iraqis on a daily basis or target U.S. and coalition troops? Do you also don't give a damn that by making that comment, you're also going to just embolden bin Laden who wants to openly retake Afghanistan with his Taliban fans?